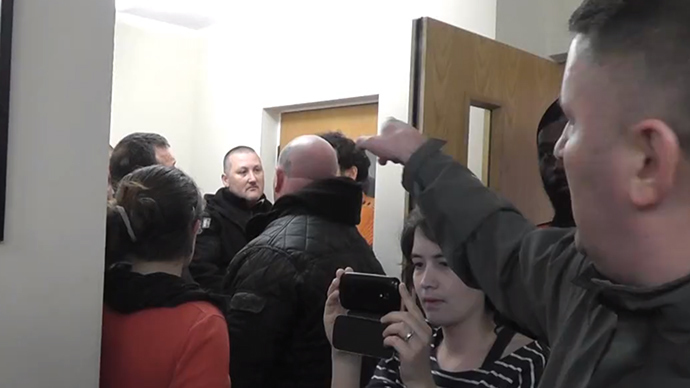 Far-right group Britain First attacked a meeting of rival activists in retaliation for a political “cabaret” protest held in UKIP leader Nigel Farage’s local pub in Kent last week. Exclusive footage handed to RT shows the attack from the besieged activists’ perspective. RT spoke to a Beyond UKIP member who was present at both the pub protest and the Britain First siege in Old Street. Bilal, a London-based PhD student, told RT: “People were shaken up, mainly because they brought so many people (eight to 10 according to the Metropolitan Police) and also because there was at least one pregnant woman in the room and, as you know, adverse stimuli can have really terrible health effects. Asked if Beyond UKIP expected this kind of backlash, Bilal said: “We expected that people would be angry about it, but we did not expect that Britain First would get involved in such a physically confrontational manner, especially not with their leader. As to the question of whether Britain First were acting independently of Farage, Bilal said: “I don't think that it can be disputed that some ties exist between Britain First and UKIP unless Nigel Farage explicitly disavows them and condemns the group. A Met police spokesman reported that a 48-year-old man had been arrested at the scene on suspicion of assault.